The graphic art of famous musicians has provided some fascinating posts on the path and we recently travelled to Scotland to add the paintings of none less than Bob Dylan to the thread. 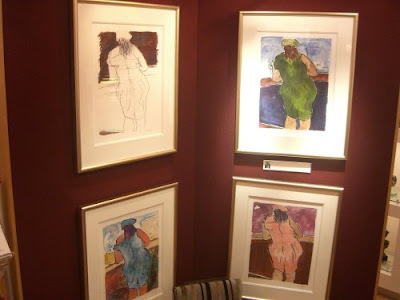 While touring in the early 1990s, Dylan created a collection of drawings that were published in a book titled 'Drawn Blank' in 1994. These expressive works capture Dylan's chance encounters and observations and were created to "relax and refocus a restless mind". Ingrid Mössinger - the curator of the Kunstsammlungen Museum, in Chemnitz, Germany - came across 'Drawn Blank' during a visit to New York in 2006. 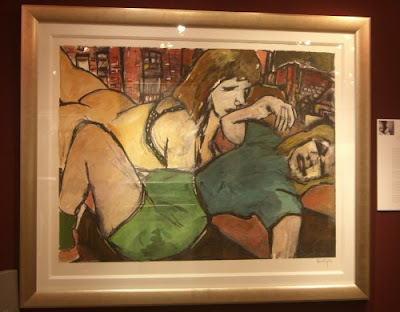 Instantly excited about Dylan's work, she contacted the artist and arranged for the first public showings of the works. 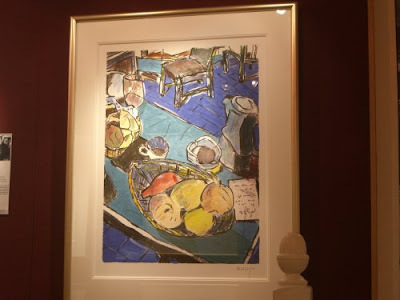 Dylan had made the drawings intending to create paintings based on them at a later date, and he used watercolour and gouache to elaborate them for the exhibition. 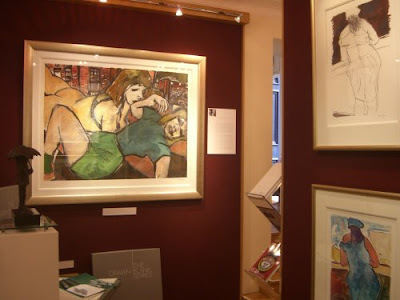 We caught up with the exhibition at the Breeze Gallery in Peebles Scotland where I took the photos of Dylan's artwork, you can see more of his paintings here. In an eerie resonance with the message of Bob Dylan's music the town of Chemnitz (Karl-Marx-Stadt from 1953-1990) in Eastern Germany was one of the other targets for the terrible air raids that devastated Dresden in February 1945 and is also very close to Robert Schumann's birthplace of Zwickau. And read more about Dylan in the birth of rock. Glad you enjoyed your visit to the gallery. Thanks for the link to your site – Dylan’s work looks great in your pics. The exhibition was incredibly successful and sold out very quickly. Since then we managed to get hold of a few copies of the more popular prints which we have mostly sold to Dylan fans overseas who didn’t get to hear about the launch until quite a bit after the UK fans. We still have a couple of prints left if you’re tempted! You can see what we have left by visiting www.breeze-originals.co.uk. You might want to add this link to your site for the interest of people visiting it.